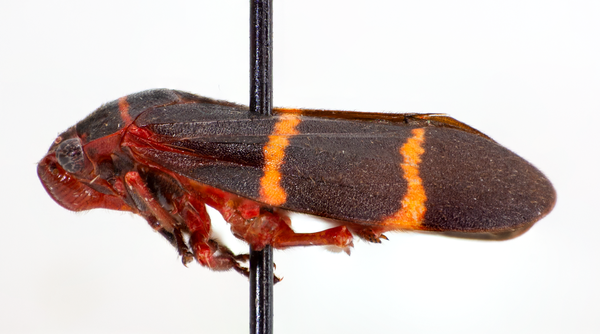 Adult twolined spittlebugs, Prosapia bicincta, resemble robust, black leafhoppers with two red stripes across the back (Figure 1). The wings are held rooflike over the back in an inverted "V." Adults are about 1⁄3 inch long. The eyes are bright red. The abdomen is bright red and shows conspicuously when in flight (Figure 2). Nymphs resemble the adults, but are smaller and lack wings. Nymphs are yellow, white or orange, but have red eyes and brown heads. The most unusual characteristic of this stage is the spittlemass. The white, frothy spittlemass envelopes the nymph and provides protection from desiccation and predators. Eggs overwinter in grass stems, behind the leaf sheath, in plant debris and other protected areas. The nymphs hatch in the spring and begin feeding. They usually feed on lower parts of the grass plants where the humidity is high. On hot, sunny days, nymphs may penetrate even deeper into the turf. The nymphs feed for about one month before they become adults. Approximately two months are required to complete the life cycle. Eggs require two weeks to hatch during the summer. Adults are one to two weeks old before they begin laying eggs. We have at least two generations per year. Past literature stated that twolined spittlebug nymphs are rarely a problem on well-managed turf. However, recent reports from turfgrass managers, especially in the eastern half of North Carolina, have proven the two-lined spittlebug is a greater pest than previously thought. Spittlebug nymphs are particularly damaging because as they feed by sucking plant juices from the turfgrass, they must remove enough fluids to form the protective spittlemass. As a result, the total amount of feeding for such small insects is considerable. The needlelike mouthparts do little damage, but the fluid removal leads to weakened, stressed grass that may turn yellow and then brown. Severe infestations can even kill the turfgrass. In addition to feeding damage, the spittlemasses themselves can become a nuisance and can give the turf an unsightly appearance. Heavy infestations of two-lined spittlebugs can produce so much spittle that the lawn actually squishes when walked upon. The only accurate way to assess the need to treat is to search through the turf down near the soil line and actually find the spittlebugs. This requires some time and effort. The turfgrass must be examined closely by parting the grass and looking for the spittlemasses that surround the nymphs. After control is obtained, the area should be periodically rechecked Reinfestation can occur quickly since the two-lined spittlebug has at least two generations per year in this state. The best time to check for nymphs and to apply pesticides to turfgrasses is late in the day because the nymphs are higher on the plants than during the hot midday. Numerous insecticides are labeled to control spittlebugs on turf and if properly applied, most perform well. Good coverage is essential. Granular formulations are not as effective as spray formulations. Be sure to read and follow all label directions. chlorpyrifos* (Dursban) 4 E, 50 WSP, Pro See label For use on golf courses; check new label. Two-lined Spittlebug. Gorsuch, C. S. 2003. Clemson University. Entomology, Soils, and Plant Science. Insect Fact Sheets, Turf & Ornamental. 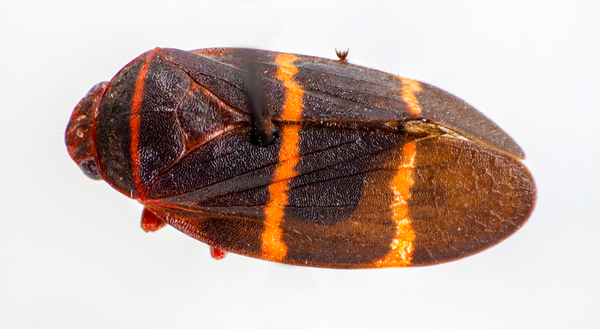 Two-Lined Spittlebug. Hudson, W. 2013. Center for Urban Agriculture, University of Georgia Extension.